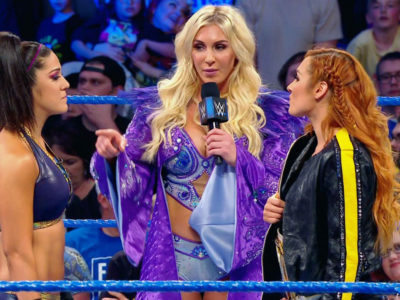 Ronda Rousey’s match-altering interference in the SmackDown Women’s Championship match at TLC understandably made Charlotte Flair and Becky Lynch want payback. When Lynch entered the arena at the beginning of this week’s episode of SmackDown LIVE, the only thing she asked of the new McMahon family management team was “to deliver [her] the RAW Women’s Champion, Ronda Rousey.” “The Man” spit another of her patented straight fire promos, calling out Rousey for just pushing over a ladder to cost her her championship, while she attacked Rousey head-on during the blue brand’s invasion of RAW. As the three women trash-talked each other, they were interrupted by a rare SmackDown appearance from Vince McMahon. 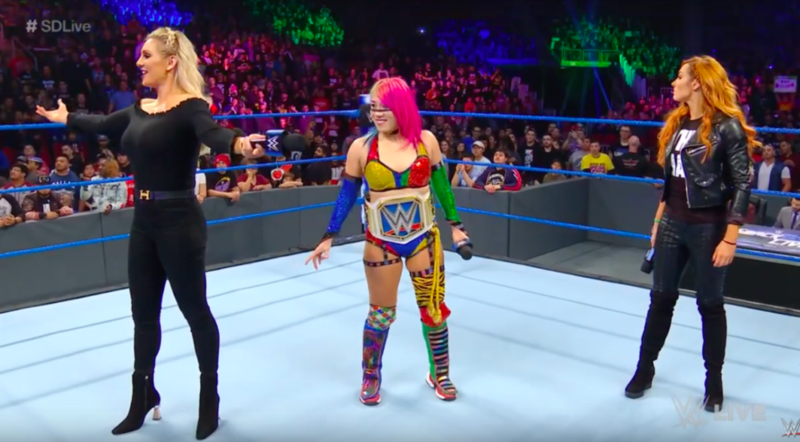 Mr. McMahon told Lynch and Flair their “conduct” was “unbecoming” and reminded them that the No Disqualification stipulation in a TLC match meant that another wrestler getting involved didn’t change the result: So Asuka’s win was still a definitive win, no matter who or what else helped her get it. He then told them: “Get over it and take charge and do everything you can. 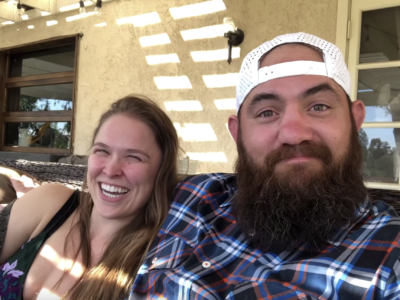 If you’ve got a problem, take it out on Ronda Rousey.” Lynch mouthed “Oh, I will.” and looked ready to throw down if Rousey happened to show up in Fresno, CA that night. Especially after Mr. McMahon’s blessing, now it looks like we really could see Rousey clash with Lynch and/or Flair sometime soon. Could they face off in singles action on the Royal Rumble pay-per-view? Could there even be another invasion of SmackDown or RAW by Superstars from the opposite brand before then? Whenever and however it all goes down between these badass women of WWE, it looks like it’s going to be exciting. There’s always a target on Ronda’s back, but she was Born Ready and you can be too.